Anna's Story: Where have you gone? It started with a mighty fry up. Bacon, eggs, mushrooms, sausages, baked beans, toast. Hearty platefuls, one for me, one for my husband. My newborn in one arm, frying pan in the other. This having a baby lark is a piece of cake, invincible me, I can do it all. Talking again, fast, unstoppable. I hadn’t slept for three nights since coming home from the birth unit. A whirl of excited competence. We just thought it was the famous love hormone Oxytocin, which serenades all new mums. Endless phone-calls, emails, texts to friends and family. Euphoric. “It’s amazing, I love it, I’ve never been so happy, oh you should see my baby, she is gorgeous, such a good baby. I even love breast feeding, it’s going so well.” Loud, fast, nonstop. As we tucked in, a hot, overwhelming rush hit me, sinking, dizzy. I needed to lie down. I abandoned the fry up, handed our baby to my husband and headed upstairs, black dots in front of my eyes and lay down on my bed. Thump, thump, thump, heart racing, within seconds, gasping for breath, clutching at my chest, choking. I yelled to my husband, up the stairs two at a time. The ambulance took half an hour; that’s a long time when you think you are dying. They checked me, reassured us, a textbook panic attack. They said my husband should take me back to see a doctor and that birth could be very traumatic for the body. It was February 2005, a few days after the birth of our beautiful girl, our first baby. I knew I was deeply unwell. I was losing my mind. The words smashed, shattered, suffocated me in fear. Disbelief. Me? No previous mental illness. No familial history of mental illness. How? Why? It made no sense. The pregnancy had been a breeze. The birth itself was reasonably normal, overdue at 41 weeks; they decided I should be induced. I had an epidural and our baby girl arrived after a normal delivery. Thirty years old. One of the happiest, most positive people I knew. Good job, strong marriage, sporty, fun, sociable, balanced, loving family. Postpartum what? Psychosis? How on earth has this happened to me? The power of autosuggestion is extraordinary; when someone tells you “you are psychotic” the fine line between sanity and insanity is washed away, leaving behind a pool of doubt for every thought to flounder around in. I didn’t trust my own mind anymore. Unlike Postnatal Depression, Postpartum Psychosis is deemed a psychiatric emergency requiring urgent treatment. I was taken in to a private psychiatric hospital in central London. My home, my prison for the next two months. A Mother and Baby Unit would have been preferable but we didn’t know they existed. My baby could only be with me during the day but had to return home with my husband at night. The lavender scented bath was a nightly ritual, ‘good to calm the nerves’ they told me. I was an obedient patient. I was going through the motions of yet another doped up, numb night with a broken heart and head. My husband and Mum had just left with my smiley, sleepy, peaceful angel, now a few weeks old. That was the hardest time, the hour after they left the hospital, alone again, in my soulless, white room, every pulse of maternal love aching to hold my baby, be with her, feed her, love her, be normal again. I was mad. A mental patient. Really? This wasn’t meant to happen. I whispered again “Will you ever come back?” No answer. Quiet, frightened tears welled and brimmed and fell in to the sink below. How about our little baby? Women who’ve suffered Postpartum Psychosis will often talk of a broken bond. I wonder to this day if she knew something was wrong. She slept and slept and smiled and slept. Undemanding, content, asking nothing of me other than the cuddles and feeds and the nappy changes I could muster. Of course there was no more breast-­feeding, I was so disappointed, it had been going so well. A big chunk of my heartbreak came from being on medication and not being able to feed my baby in the way I’d imagined. The emotional pain aside, my most often repeated line about my experience with Postpartum Psychosis is that I was one of the lucky ones. I was diagnosed and treated quickly and I had a phenomenal husband, wonderful parents and close friends beside me. My amazing Mum moved to London and alongside my husband (who had to return to work in time) looked after our baby with me. My mum and baby came to see me every single day in hospital, we would go for long walks and I would do all I could manage for her. My husband came every evening. Thankfully, with this daily connection, she and I never once lost our bond. Had I been in a mother and baby unit, with perinatal expertise, the heartbreaking separation at night, could have been avoided. The stint in the psychiatric hospital under a generalist psychiatrist lasted a couple of months and my drug treatment seemed to have limited success. My medication took a long time to get right. I was allergic to the first combination and didn’t seem to respond to the second. After about two months the psychiatrist recommended a course of intensive ECT (Electro Convulsive Therapy). This felt very dramatic and was an incredibly hard choice for my husband and my parents to have to make on my behalf. Having spoken to another psychiatrist, a friend of the family, they took the decision to give it a go. I had no capacity to object or even fathom what would help me. Zombie-like, semi-mute, I had an intensive course of treatments over a two-week period. Each treatment meant a general anesthetic. This was an awful time, etching a deep mental scar. I stood outside myself looking in, detached but present. I watched myself being wheeled in. The room and everything in it dauntingly white, overly cheerful faces of the clinical team greeting me, trying to reassure me as I lay powerless, helpless, tense, terrified, exhausted. Here I go again and then the anaesthetic and then nothing, until I woke, then tears. I’ve never known vulnerability like it, before or since. It’s not always helpful to second-guess what you cannot change. Looking back I’m not convinced a perinatal psychiatrist would have made the same choice with the ECT. We had no way of knowing there was a better way and everyone did what they thought was best. The long days dragged on, numb days, family and friends visited. My only reason for keeping hope was my angel baby, sleeping and smiling and sleeping. Was this how it was going to be? Was I ever going to be my old self again? I was allowed out for a small trip to Kent in late April and that changed everything. I was to spend a few days at my parent’s cottage, fresh air, homemade food, restful and wrapped in love. Everyone was hopeful, an expectation that maybe this was it, maybe I was on the mend. On the first morning away from the hospital, I awoke feeling anxious and vulnerable. Suffocating agoraphobia, deep fear of another panic attack. I came downstairs, shaking, tearful. Why won’t this leave me alone? Mum called a local clinic, she knew they offered psychiatric help; they said they could see me right away. I was disappointed, terrified and so upset. Here we go again. Why can’t I get better? No one had been able to say that until now. It changed everything. I broke down and sobbed. This new psychiatrist was a perinatal specialist and had seen and treated countless cases of Postpartum Psychosis. He gently recommended I should be admitted for just a few days whilst he changed my medication. He insisted my baby was with me at all times unless I was sleeping. Within just one week, I had made a remarkable leap towards recovery. Already I could look in the mirror and see Anna again, me. There I was with a hopeful smile. The whisper again, “There you are, I know you.” I knew then I was coming back. By May, with my four-month old girl in arms, I was enjoying my baby, surrounded by friends and family, functioning as myself again. Laughing, socialising, long walks, day trips, good food, and living life once more. I saw this wonderful new perinatal psychiatrist weekly at first, then monthly, slowly, gradually, gently reducing my medication with each visit. He talked to me like an adult rather than a patient and reassured me with every doubt I had. I went from better to one hundred percent by the end of the year and made a full and complete recovery. Our son, was born on the 13th May 2008, three years later. As with our daughter, my due date came and went and this time we let nature take it’s course, no drugs, no intervention, a calm, relaxed, natural birth at 42 weeks. Great debate came before the decision to have a second child and we were all worried. I spent a long time preparing, especially mentally. Acceptance, I decided, was the only way to approach it. I’d learnt vulnerability the hard way. I accepted that it may happen again and that, whilst terrifying, it would be all right because I knew. I knew what Postpartum Psychosis was, where to go for help, how to deal with it and that it was all right, in time I would recover. I was one of the lucky ones. Thankfully, there was no hint of psychosis second time around, no anxiety, no mania, no delusions, no insomnia. Nothing. 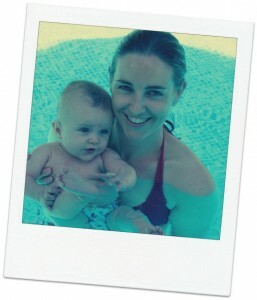 I was myself; I was there, free to enjoy a happy, peaceful and special time as a Mum. To my girl, thank you my angel baby. To my husband, thank you my rock. To my Mum, thank you my hero.